Plate o’ greens, drizzled with nectar o’ the (ranch) gods! I generally eat a lot of salad, and while I do like salad, I need to switch up the dressings every now and then or my palate gets bored and craves carbs. 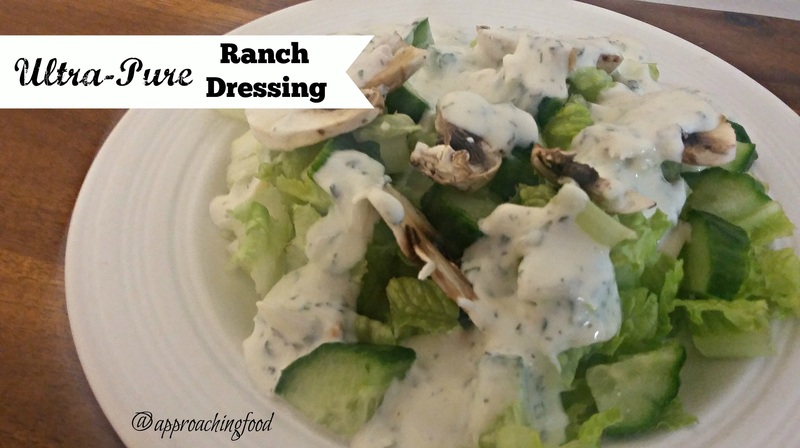 I recently mixed up this Ultra-Pure Ranch Salad Dressing, and I love it so, so incredibly much! What I really love about it, is that I know exactly what went into it — no preservatives, no commercial additives, no artificial colours or flavours, just pure herbs and dairy. Sounds too good to be true? It’s not! 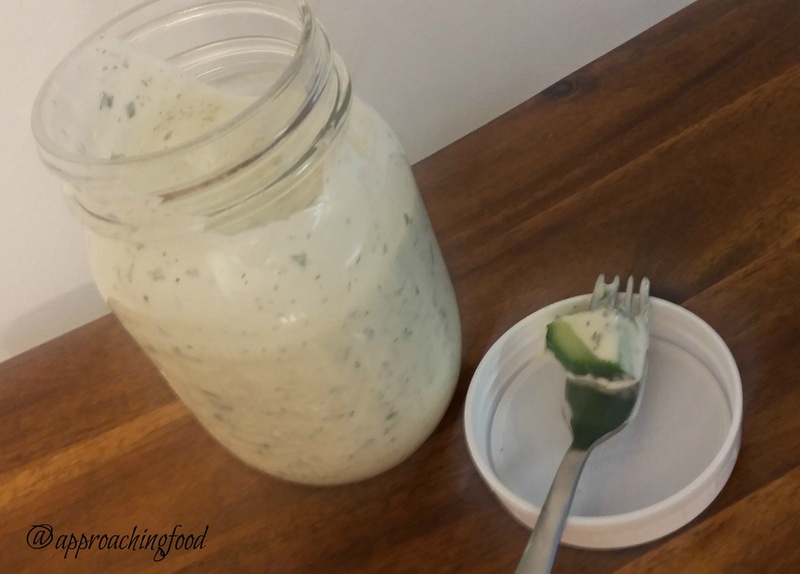 I mixed up my own dry ranch mix using this recipe, made my own mayo using this recipe (WAY easier than you think), and used some of my own homemade yoghurt. The secret ingredient that makes this dressing so good? Buttermilk powder, which I bought at a local bulk store. That, and the lack of anything artificial, is what makes it so tasty! This is as pure a ranch dressing as ever came from a ranch. Or in my case, condo. Mix the ingredients all together and serve over salad! Your loved ones (and your taste buds) will thank you! This dressing is so good just drizzled over plain lettuce, or even used as a loose dip. I can’t wait to pack it for work lunches so I can have that yummy fresh taste on my lunch break. And it’s all healthy! Doesn’t food taste even better when you know it’s good for you? Yum, yum, yum! Sometimes I feel like there should be foodie accomplishment awards, like for when you make your first loaf of homemade bread, or as in this case, when you make a recipe out of ingredients that you’ve made yourself! If a foodie accomplishment award existed, what would you award it to yourself for? Let me know in the comments! Next Post: Speaking of food that’s good for you, I came up with a recipe for a peanut butter & jam smoothie, that’s packed full of protein, fibre, and antioxidants, and tastes EXACTLY like a PB& J sandwich! Stay tuned! This entry was posted in Salads I Have Known and Loved on May 1, 2017 by Margaret. I like rewarding myself so my “foodie accomplishment award” would be for making perfect fluffy rice. (Instant rice is cheating) I seem to either put too much, or not enough liquid in the pot. Exact measurements has not worked either, I still mess up. So I reward myself for making perfect rice, once. I know with enough practice, I will eventually be able to do it all the time. After posting my comment, I feared you might quiz me on my shortcomings so I ACTUALLY measured everything I put in the pot and wrote it down. I then accidently threw the scrap piece of paper away while cleaning up. I was worried that my culinary incompetence might be exposed to the world. However, by now I should have realized my secrets are safe with you. We are too much alike to tell on each other. I do that all the time! (write down measurements and then misplace the papers) Don’t worry, your secret is safe with me…and the rest of the internet!